In a soil garden, plants are rooted in the soil and draw nutrients from it. In hydroponics, a nutrient rich solution is fed directly to the plant roots. In some hydroponic growing systems an inert growing medium, such as perlite, rockwool or expanded clay pebbles is used in place of soil. These growing mediums are porous and absorb the nutrient solution, allowing the plants to use it as needed. The day your new hydroponics kit arrives is much like Christmas, regardless of the time of year. The same devastation can arrive with your kit as arrived with that awesome batteryless toy on that long ago Christmas morning, if you haven’t done your homework! The key to a happy day and a quick start to your hydroponics growing is to make sure that the kit you decide on is complete. A complete kit will include the following equipment: lighting, reservoir, pump, growing chamber or tray, delivery system, and a timer. It will also include your nutrients, growing media, mesh pots, and possibly a means of testing pH. Read the description carefully, ask your vendor questions, and make sure that all these components arrive at your home at about the same time to avoid the anxiety of needing “one more part!” before starting your system up. In my case, I want to grow vegetables, salad greens, and herbs. I am not a sport fisherman, although I don’t frown upon it. I fish to eat, and to me, flowers and ornamentals are like catch and release gardening (please don’t tell my wife I said that!). I want a maximum yield in a minimum space with little in the way of maintenance and operating time. So I am going to look at an ebb and flow system with High Intensity Discharge lighting capable of using both High Pressure sodium and Metal Halide bulbs. This lighting scheme provides the flexibility to maximize growth at both vegetative and fruiting stages, while the ebb and flow system is simple to operate and low on maintenance. 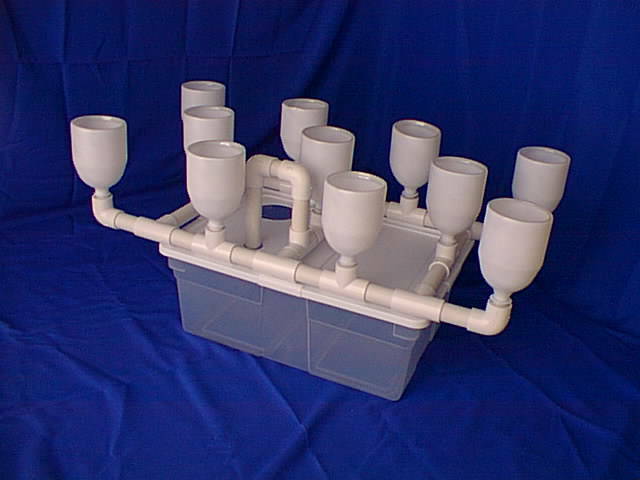 Remember though, there are other lighting options and there are at least five other types of hydroponics systems. Your needs may be different than mine, so be sure to do your homework ahead of time. With a little planning and research, the day your kit arrives can be the day your system goes into operation. Just don’t forget the batteries! Listed below are some of the common kits available to get you started.